“The last enemy to be destroyed is death.” That was what Saint Paul told the Corinthians (1 Cor. 15:26). We believe in the resurrection—not just the immortality of the soul but also the resurrection of the body. That idea marked the difference between the Christians and their pagan neighbors. A dead body was something a pagan didn’t want to think about. The mere sight of a corpse made a pagan ritually unclean, not to mention giving him the willies. Yet Christians treated dead bodies as though they were worth something — as though they were still somehow connected to the honored dead, not just a cast-off container for the soul. The account of the martyrdom of Saint Polycarp of Smyrna tells us what happened after he died. not take away the least memorial of him, although many desired to do this, and to keep fellowship with his holy flesh. For this end he suggested to Nicetes, the father of Herod and brother of Alee, to go and beg the governor not to give up his body to be buried. “Otherwise,” he said, “they might forsake the crucified one and begin to worship this one.” . . . The centurion, then, seeing the strife excited by the Jews, placed the body in the midst of the fire, and it was burned up. Therefore, we later took up his bones, which we regarded as more precious than the most exquisite jewels, and purer than gold. We put them in an appropriate place, and there, when we are gathered together (if we have the chance) with joy and rejoicing, the Lord shall grant us to celebrate the birthday of his martyrdom, both in memory of those who have already finished their course, and for the exercising and preparation of those yet to walk in their steps. This is the first full account we have of a Christian martyrdom outside the Bible, and we see that the Christians were very much interested in the physical remains of the martyr — his relics. Polycarp’s friends almost laughed at the suggestion that they would turn from worshipping Christ to worshipping Polycarp — only someone completely ignorant of Christian belief could suggest that. But they entombed what few remains they could recover “in an appropriate place” — which meant a place where they could meet on the anniversary of Polycarp’s death and celebrate his feast day. Notice, too, that the word they used for “anniversary” is literally “birthday” — they celebrated Polycarp’s birth into eternal life. We also notice that, in collecting Polycarp’s remains, the martyr’s friends did not think they were doing something that was necessary for Polycarp’s good. There’s no indication that they thought Polycarp would be any worse off because his body was burned to ashes. They didn’t even seem to believe that he would be any worse off if they hadn’t collected his bones. But they would be worse off. The reason they give for wanting to collect Polycarp’s relics is that they wanted “to keep fellowship with his holy flesh.” The idea of “holy flesh” would have made no sense to a pagan philosopher, but it made perfect sense to a Christian. We were created in the image of God, and the Son of God took flesh. He gave His flesh for food, which in the Eucharist is assimilated to the flesh of every Christian. That makes the body more than a sort of envelope for the soul, a container that is cast off at death. When we Christians speak of the dignity of the body, we mean that the human person is composed of body and soul. The body is holy because we were made in the image of God, because God became one of us, and because our bodies are united to the flesh and blood of God in Christ. This article is from a chapter in How Christianity Saved Civilization. Click image to learn more. Death was the riddle the pagans couldn’t solve. What happened when people died? There might be life after death, or there might not be. If there was, it might be something pleasant, or it might be only eternal gloom, even for the virtuous. Gloom was what Homer saw, and Homer was the closest thing the pagans had to a Sacred Scripture. Homer was the author most essential to any curriculum in the Greek-speaking world — and in the upper classes of Roman society, where Greek occupied the same place as the universal language of culture that Latin occupied during the Renaissance. So Homer’s idea of the afterlife counted for something. In The Odyssey, Odysseus visits the realm of the dead in Ha­des and meets the great men who fell in the Trojan War. These were not the evil wretches whose misdeeds litter history; these were the exemplars of Greek heroism. And what has Achilles to say about death? Than sov’reign empire hold o’er all the shades. Homer puts these words in the mouth of one of his characters, but they seem to represent a common Greek belief. Death was rotten, even if you were a famous hero; better to be a poor laborer hired by a poor farmer than to be dead. Under those circumstances, death was certainly not something to look forward to. The best that could be said was that it might sometimes be better than the alternative. Naturally, one thing a Roman couldn’t abide was a dead body. Cremation was the normal Roman funeral practice: it got rid of the dead body quickly, and (at least if you were lucky) it kept the spirit of the deceased from coming back to haunt you. Christians believe in the resurrection of the body — we say that every time we recite the Creed, but we seldom think what an odd thing it appears to be. Some (not all) pagan philosophers thought that the soul was immortal; they saw the body as a machine animated by the soul and dead without it. But it simply never occurred to pagans to talk about the resurrection of the body. Now if Christ is preached as raised from the dead, how can some of you say that there is no resurrection of the dead? But if there is no resurrection of the dead, then Christ has not been raised; if Christ has not been raised, then our preaching is in vain and your faith is in vain. We are even found to be misrepresenting God, because we testified of God that he raised Christ, whom he did not raise if it is true that the dead are not raised. For if the dead are not raised, then Christ has not been raised. If Christ has not been raised, your faith is futile and you are still in your sins. Then those also who have fallen asleep in Christ have perished. If for this life only we have hoped in Christ, we are of all men most to be pitied. But some one will ask, “How are the dead raised? With what kind of body do they come?” You foolish man! What you sow does not come to life unless it dies. And what you sow is not the body which is to be, but a bare kernel, perhaps of wheat or of some other grain. But God gives it a body as he has chosen, and to each kind of seed its own body. For not all flesh is alike, but there is one kind for men, another for animals, another for birds, and another for fish. There are celestial bodies and there are terrestrial bodies; but the glory of the celestial is one, and the glory of the terrestrial is another. There is one glory of the sun, and another glory of the moon, and another glory of the stars; for star differs from star in glory. This is the reason for what must sometimes seem like a strangely ambivalent attitude toward the body among Christians. On the one hand, it doesn’t really matter what happens to the body — the resurrection will happen anyway. On the other hand, the body really is part of the person, and, as such, it deserves reverent treatment. Wherever the Church spread, Christians took up the practice of burying their dead. The first major building projects of the new faith in Rome were not churches — one never knew when the next persecution might break out. The first visible Christian structures were the catacombs. In the catacombs, the Christians buried their dead and celebrated the “birthdays” of the martyrs. They surrounded their loved ones with the most elaborate and costly art they could afford — sometimes mere graffiti, but in some cases, they produced some of the most striking paintings that have survived from ancient times. The more martyrs there were, the more often Christians assembled in the catacombs. The catacombs were quite visible constructions — you can’t dig out a system of tunnels, with masons and architects and artists all contributing to the work, without people knowing about it. The pagans noticed. They couldn’t help noticing. The Roman catacombs eventually developed into more than sixty miles of labyrinthine underground corridors. Estimates of the population of this “city of the dead” range into the millions. And Christians, understandably, became known as the people who handled dead bodies — who polluted themselves at graves. Yet there must have been something attractive about the Christian way of burial. It provoked a strong fascination, perhaps because it confronted Romans’ worst fears. Christians were the people who dug graves and handled bodies, so they were the people who had no fear of death. The courage of the martyrs was a billboard advertisement for Christianity, but it may be that the courage of the Christian fossores — the “diggers” — was almost as impressive. Confronted with death, Christians refused to look the other way. They celebrated the martyrs’ deaths, because they knew the answer to the riddle. So far, we’ve talked about how Christians honored the body in death. Yet we also know that Christians never thought this honor was necessary to the well-being of the dead. It was something Christians did to show reverence for the departed and for the God who had made them in his image. So we find an interesting ambivalence in the way the early Christians thought about the bodies of the dead. On the one hand, it was appropriate to show honor to the body. On the other hand, it didn’t really matter what happened to it. How can we make sense of that seeming contradiction? It’s not really contradictory at all. The honor we show to the bodies of the saints is something we do for ourselves, not for them. One of the most affecting scenes in Saint Augustine’s Confessions is the death of his mother, Monica. There is nothing in classical literature like it: a man who mourns the loss of his mother, not only because she is his mother, but because she was a fountain of wisdom. Monica was the steady rock in the family while her young son ran off and experimented with every fashionable idea, and her joy was complete when he returned to the Catholic faith. Augustine, in turn, was devoted to his mother. I held my peace and kept from weeping; but my brother said something to the effect that he wished — as if it were a happier thing — that she might not die abroad, but in her own country. And when she had expressed her mind to us with such words as she could, she said no more, but lay struggling with her disease, which was growing worse. Saint Monica is a very good example of that ambivalence about the body that we have been talking about. On the one hand, the body is unimportant. God will raise us on the last day with a glorified body. But, on the other hand, the body is a visible, tangible connection with the Christian who is still living. Monica was buried at Ostia, far from home; her sons followed her wishes and didn’t worry about getting her back to Africa. So her body was unimportant. But her relics are in Rome now, venerated by countless thousands of pilgrims every year. So her body is very important indeed. This is one side of the coin: Christians have no need to worry about what happens to the body. Nothing that can happen will harm our chances of resurrection. Yet it does not follow that the bodies of the departed are to be despised and flung aside — and certainly not the bodies of the just and faithful. Their spirits used those bodies as organs and vessels of all good works. Our reverence for the bodies of the departed is not pointless. It reminds us of our still living connection with all who have ever lived. Augustine exulted when the relics of the martyr Saint Stephen were transferred to his diocese. We believe in the communion of saints, as the Creed reminds us. If we bury our dead near the memorial of a saint, then we remember to ask that saint to pray for them and to pray for us. The walls of the catacombs — and tombs throughout the ancient Christian world — bear abundant testimony to the interrelationship of Christians living on earth with those living in heaven. Chiseled inscriptions and scrawled graffiti communicate the same common pleas for the intercession of the saints. The idea that a saint can be a patron is so familiar to us that we probably never think about what the word means. This is a fascinating example of how early Christians saw through the barrier of death. The fact that we still have a connection with the saints who have gone before us, that their prayers can do us good, was interpreted by the Roman Christians in a particularly Roman way. They imagined it as being very much like the patronage system that permeated Roman society. In Rome, an ambitious man, or one who just wanted to get along in society without too much trouble, would attach himself as a client to a patron — usually a man who was richer than he was. The relationship was good for both parties. The client had the rich man’s support in the law courts — it would be very dishonorable for a patron to see his client suffering any preventable injustice. If the client was in financial trouble, the patron would bail him out. The patron welcomed the client into the extended family as a sort of auxiliary member, one who could take his (suitably humble) place at family worship. The more clients a rich man had, the better he was thought of in society. The client was expected to support his patron if he ran for political office and stand with him if his patron was having trouble with some other rich, powerful person. This system gave Christians a perfect model for understanding their relationship with the saints. The saint was rich: he possessed all that heaven had to offer. By placing themselves under the protection of a saint as a patron, Christians could hope for a good hearing in heaven’s court. If they were in trouble, they would ask the saint to intercede for them with almighty God. The ancient homilies and graffiti tell us what Christian clients sought from their heavenly patrons: the cure of a child, the safe return of a traveling spouse, deliverance from an oppressor. We no longer think of the world in terms of the client-patron system of ancient Rome, but Catholics still use that word patron to describe their relationship with a favorite saint. And here we have the real completion of the Christian revolution: victory over death. Pagans ran screaming from ghosts; Christians ran for comfort to saints. “The last enemy to be destroyed is death.” The revolution in the Christian approach to death sums up all other revolutions in our approach to life. In Christ, the bonds of a loving family continue beyond death. Human beings have dignity, even when their bodies are decomposing. And even the work of diggers and corpse handlers has become a holy task. The position of the fossores, the diggers of the catacombs, was considered an ecclesiastical office. Once upon a time, bodies were buried far outside the walls of great cities like Rome. Today, Rome’s most prominent monuments, its Christian basilicas, stand over the gravesites of the apostles — and even the Colosseum is preserved primarily because Christians died there. Yet all those who died still live today, and they keep fellowship — they keep communion — with the Church on earth. 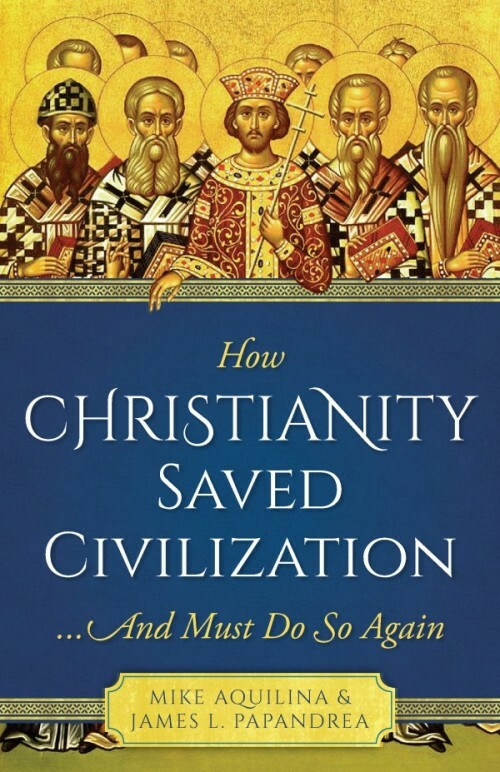 Editor’s note: This article is adapted from a chapter in How Christianity Saved Civilization…And Must Do So Again, which is available from Sophia Institute Press. Mike Aquilina is the award-winning author of more than forty books on Catholic history, doctrine, and devotion. His works have been translated into many languages. He has hosted nine television series and several documentary films and is a frequent guest on Catholic radio. James Papandrea is a teacher, author, speaker, and musician. He is the Associate Professor of Church History at Garrett-Evangelical Seminary (on the campus of Northwestern University) in Evanston, IL.